Breathtaking views with the convenience of being so close to town! 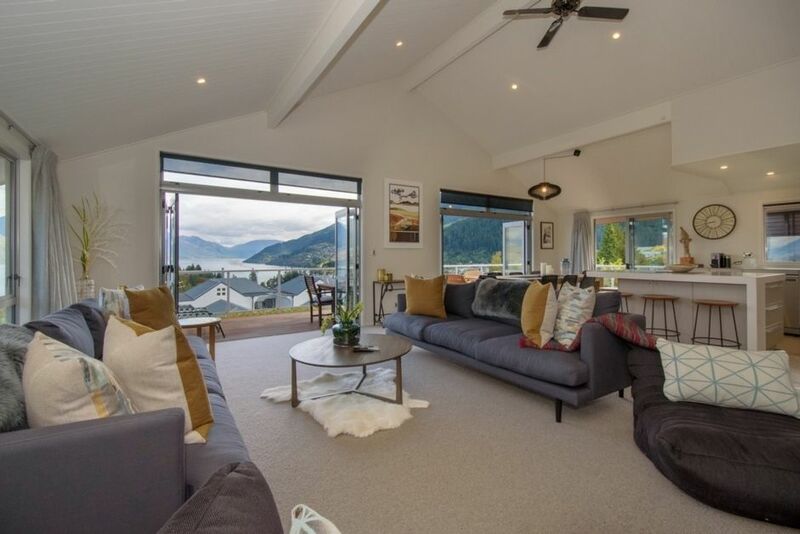 This beautiful 4 bedroom home overlooking Lake Wakitipu has expansive lake, and Mountain views. It is an easy 8 minute walk from central Queenstown, and a 7 minute drive to the airport. Great family holiday house offering a spacious, modern layout with lovely wrap around decks, level yard for children and children's wing with bunk room and playroom. Situated in a quiet cul-de-sac it boasts all the conveniences of home including Sky TV and Broadband internet with computer. Supermarkets, shopping and Restaurants of Queenstown all within walking distance. The house contains 4 Bedrooms, includng 2 king splits, 1 queen bed and 2 sets of bunks. There are 2 1/2 bathrooms, playroom, modern fully equipped kitchen, full laundry and great heating throughout. A purpose built, heated drying cupboard provides storage for all your ski gear. This, in addition to the easy 20 minute drive to the skiing fields of Coronet Peak make "Vista Del Lago" the ideal skiing holiday house. Enjoy a romantic getaway or a fun group family holiday in this magnificent home! You are welcome to bring your own linen or we can have it supplied and fitted including towels for a small fee. Great size property for a large group with all the amenities, in a private location. Great value for the distance to town and property type. Property manager was good to deal with, responsive and flexible. Home had everything you needed for a comfortable stay. This was an ideal property for my extended family during a skiing holiday in Queenstown. This was an ideal property for my extended family during a skiing holiday in Queenstown. Large space with good seperation between the rooms and handy to town. Definitely consider coming back here next year. The property was amazing, exactly what we were looking for. The property was amazing, exactly what we were looking for. The fact that it was only a 10 minute walk from town made it extremely convenient and cost effective. Absolutely amazing and would definitely recommend for a medium-large group wanting to stay in Queenstown. The location was great, so close to town and of course the views are amazing.